Gamespot.com rated this game 3.5 outta 10, claiming “just because a game seemingly aims to be bad on purpose doesn’t make it any less of a bad game.” Lame News’ response: HAVE YOU EVER SEEN THE SHOW!? The problem is reviewers are rating this game in such a general and bias way. It’s not supposed to be Tiger Woods PGA meets Halo. In a nutshell it’s like that episode of South Park where Stan is so sick of playing the uberly difficult Guitar Hero and and trades it in for a game called Heroin Hero where you chase a dragon you never catch. This isn’t the thinking man’s game, it’s strictly for Aqua Teen Hunger Fans and it shouldn’t be penalized for it. Let’s forget about the gameplay for a second and discuss the real value of the game: fanservice. While you might be able to beat the game in under 5 hours, all the bonus content will keep busy for a while. You’ve got an artwork gallery, 12 cameo clips from the show, 12 frickin’ hilarious cut scenes (video right), 4 complete episodes including a brand-new episode made solely for the game, and an unlockable spin-off episode featuring an apocalyptic showdown between the Broodwich (an evil submarine sandwich) and his heavenly counter part! Zombie Ninja Pro-am plays like a 12-hole long episode. There are constant visual nods to the series like the Trenton Tar Pits and the gameplay is complemented by some truly unique commentary from who else but the generic Commentator Guy and Cybernetic Ghost. (video left) Both Master Shake and Frylock are playable but Meatwad can only be accessed as a defensive barrier. To help get you past the enemies there’s a host of weapons laid out for you from the Foreigner belt which freezes your enemies cold to a guitar that disorientates them. In between holes you’ll all be challenged to golf cart races, which are probably the funnest part of the game. A golf cart on the Moon handles just like you’d think it would. The only reason I can’t give this game a perfect score is some seldom but major glitches where your character or an enemy can become stuck and it requires you to restart the level. On a scale of a 1000 suns, Aqua Teen Hunger Force: Zombie Pro-Am gets 900 suns. All this for just $29.99? Nope not if you smart and since you’re a Lame News Subscriber naturally you’re smart. What you’re not Subscribed!!! What are you waiting for scroll up and click as hard as you can! 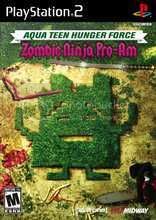 But I digress, here’s the best deal out there and I’m not getting paid to say this either, Buy.com is selling Aqua Teen Hunger Force: Zombie Pro-Am for $28.99 but if you sign up for Google checkout (a free service) you get 10 bucks off. That’s $18.99 for a brand-new game that’s packed with bonuses and free shipping! The only way to get it cheaper is to downloaded of the internets but if you’re thinking of doing that you must not have seen the Boondocks PSA “Don’t Steal Movies” I posted last month. Post Postscript: So do you think you’ve got what it takes to become a Moon Master? Then leave a comment and do it with power of 1000 suns!